Alfred walks in on Bruce Wayne studying all the casefiles and becomes disturbed that the young boy is wasting away indoors when he could be outside living his life. “What if it’s a complete waste of time?” asks Alfred. Ultimately, that’s the question everyone faces, both in the show and in real life. What if everything that you put your mind to turns out to be nothing in the end? To many in the police force, this question may come up more than one time in their careers. No matter how much crime is prevented, no matter how many criminals are captured and locked away, crime will always exist. So again, what if it is all for nothing? Well from the law enforcement point of view, maybe Bruce provides the answer: “To understand them.” Understanding criminals is all part of the job because a law enforcer must be able to think like a criminal in order to catch a criminal. Gotham is doing an excellent job setting up this dynamic of different levels of criminal minds. Tonight’s episode surprised me with the inclusion of metahumans. I did not expect to see super powers at all on this show, but the way the creators decided to present super powers in the development stage is brilliant as opposed to completely ignoring the idea. The key phrase is “development stage” emphasized by the gruesome side effect of spontaneous bone disentegration. The death of the guitar man holding an ATM machine above his head was particularly creepy as his legs and arms begin to snap under the weight after the drug’s affects had worn off. At the end, I appreciated the scientist’s machine using similar pipes that Bane uses in his traditional costume for Venom. This was most involved we have seen Bruce Wayne since the first episode. Instead of a quick scene to remind us he’s Batman, we actually see him leave Wayne Manor and attend a charity that the mad scientist plans to gas. The unofficial Detective Bruce Wayne is figuring out that Wayne Enterprises may be more corrupt than he had once believed. 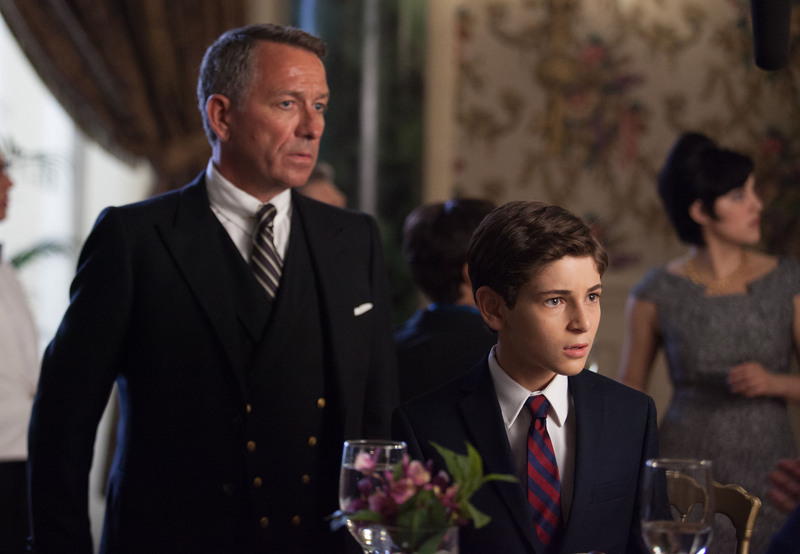 As Wayne Enterprises becomes more involved in the show, I’m sure Bruce will become more involved as well. 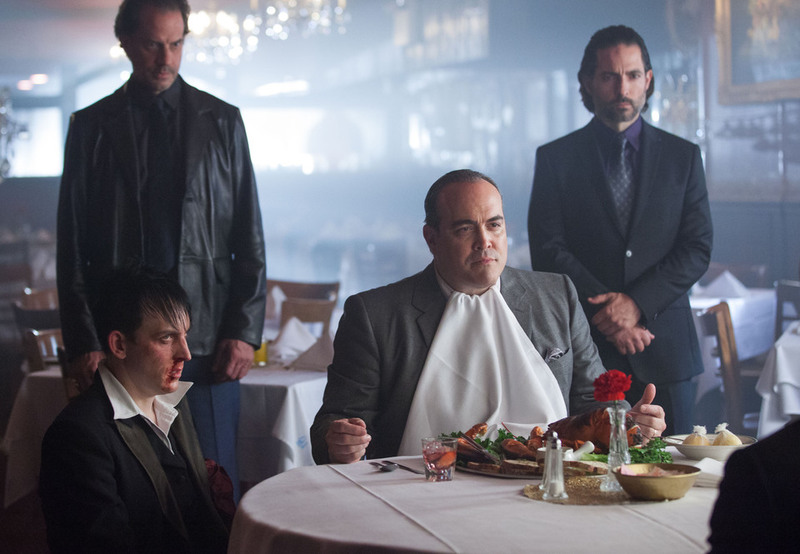 Jim Gordon basically becomes blackmailed by Maroni after the Penguin tells Maroni his past. I thought this was one of David Zayas’ (Maroni’s) best moments on the show so far. His seriousness paired with his warm happiness can be off-putting at times. It’s also funny how he seems to always be eating in most scenes we see him. I may be reading into this, but is Gotham developing the seven deadly sins in these villains? Maroni is Gluttony; Falcone could be Greed or Pride; Fish could be Lust? Just a thought. Fish Mooney is training her “weapon” throughout tonight’s episode to create this female character that will reel Falcone into the trap. And not only is Fish planting the bait, she is also stirring up one of the other members of the Falcone family who will assist in the coup d’etat. At the very end of the episode, Falcone is approached by Fish’s new girl whom he quickly falls for which to mean seemed to good to be true even to him. But, I’ll give him the benefit of the doubt. His only other option seemed to continue feeding pigeons. I enjoyed the final scene of Bruce and Alfred back at the manor after they escaped the Viper gas danger. Alfred sits down starts working with Bruce looking through case files. Bruce reserved looks of happiness made the moment touching as this is the first time since the death of his parents that we see Bruce smile and actually bond with Alfred. I look forward to seeing how their friendship progresses. “Viper” had a big surprise of super powers which means the creators are open to all avenues of Batman lore, albeit in the “development stage.” What I find most interesting in this show is the dynamics between the different types of villains and how their methods differ yet relate. It will be fun to see how the inevitable war between the Falcone’s and the Maroni’s plays out. Finally, Falcone’s favorite opera song is a famous Soprano Arias from Italian operas called “O, mio babbino caro,” which means “Oh, my beloved father,” a fitting song.